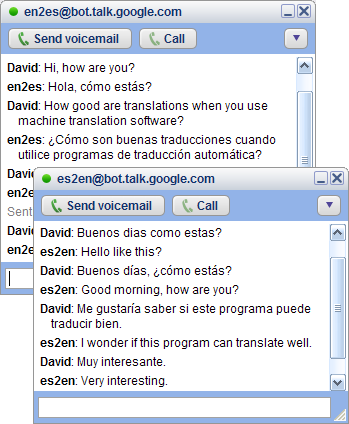 Google just began offering instant machine translations for Google Talk and Gmail. You can access the new service from within Google Talk, the chat window in Gmail or any IM client that supports the Jabber protocol. To use the service, add these addresses as friends en2es@bot.talk.google.com for English to Spanish translations, or es2en@bot.talk.google.com for Spanish to English translations. You can also add the robot to a group chat and let it translate between the two of you on the fly. Here is a complete list of languages and their codes that are available. The translations are far from perfect, as you can see from the following dialog. David: How good are translations when you use machine translation software? en2es: ¿Cómo son buenas traducciones cuando utilice programas de traducción automática? The translation probably should have been something like this: ¿Qué tan buenas son las traducciones cuando usas programas de traducción automática? When translating from Spanish to English, you need to use all the correct punctuation marks and diacriticals to help it guess the right meaning. David: Buenos dias como estas? David: Buenos días, ¿cómo estás? es2en: Good morning, how are you? The iPhone went on sale today. In the shadow of that exercise in suspense, I have one comment and a few suggestions to phone manufacturers in general. First my iPhone comment. The thing looks great, has great features, and I want one, but there’s a deal breaker. It has no physical buttons. You can’t use the thing without using both hands and looking at it. I don’t like to use the phone too much while driving, but occasionally I do, and when I do, I use one hand and make my call without looking at the phone. All Steve Jobs needs to add to the iPhone are three or four hardware buttons across the bottom to use for answering/hanging up and to do some speed dialing. That would make it easy enough to do the most common things without looking at the phone. Even if you don’t dial and drive, you might save yourself from walking into a telephone pole on the sidewalk if the thing had a couple of physical buttons. The buttons can be buffed stainless steel with a little indentation and look really nice with the phone, and make it a lot more useful in the process. On to my suggestions for cellphone makers. I might be wrong, but to me these are no-brainers. But then again maybe that’s why I’m not in the cellphone design business. 3 Make your own voice come out of the cellphone’s earpiece when you are talking to help you moderate your voice and not shout in public places. Old fashioned landline POTS phones do it, why can’t cellphones too? 2 Make use of voice to text and text to voice technology. Allow the user to create a text message by speaking it into the phone. Allow people to listen to their text messages in a computer-generated voice, spelling out unknown or invented acronyms. Let someone read their voicemail as text messages in a noise-sensitive environment. If they still can’t pack enough processing power or memory in a phone, let the hard work be done on a server and downloaded to the phone. 1 Make a button on the phone to answer a call and put it on hold at the same time. It would work like this: You’re in a meeting and your phone vibrates, you optionally look at the caller ID and decide to answer the call. You press a button on the outside of the phone and drop it in your pocket. You then casually get up and walk out of the room. No one heard anything or saw you running from the room with a phone pressed against your ear. When you pressed the button on the phone, the call was answered and a generic message was played to the caller: “Your call has been answered, please wait a few moments for the receiving party to initiate the conversation”, or alternately you could pre-record your own “Can you hold?” greeting. As soon as you safely duck into the hallway, you can open your phone. Since this is a Spanish learning blog, your homework is to translate this post into Spanish. Extra credit for correctly translating ‘deal-breaker’ and ‘no-brainer’. You’ve undoubtedly seen the little electronic dictionaries where you have to punch in a word with teeny-tiny keys and it gives you a translation. Some of those dictionaries are even talking dictionaries, where you can select a word and hit a key, and it will speak the word. It’s time for some new technology. We need listening dictionaries. I want a little hand-held device that will listen to my interlocutor, interpret what she says in English on-the-fly, then allow me to answer in English and the device would spit out a version in the other language. Am I asking for too much? Yes. But I predict that in fewer than 5 years we could see a usable product like the one I’m describing. Voice recognition software is rapidly improving. Machine translation, while leaving a lot to be desired, is also improving. I’d say we could see a listening/talking dictionary in less than 5 years that would be a useful interpretation tool, adapting to individuals’ voice/dialect/vocabulary automatically. And that’s all I did to fix it. I guess this would actually be a bug in Firefox, because normally when you delete the downloads history, it clears out the downloads.rdf file. If I’m wrong on this, let me know.